Compare discounts for Hotels Motels in Portland, Oregon! Portland, 'The City of Roses' offers big city entertainment, business and recreational opportunities with small town qualities. From the world-renowned International Rose Test Garden to skiing Majestic Mount Hood, Portland is a world-class vacation destination that is too often overlooked by travelers. Unlike many big cities in the US, the streets of Portland are nice to stroll through and since the buses, the Portland Street Car and the MAX light trail are all free in the downtown area, visitors can enjoy their stay without a car. Visitors will find excellent restaurants, Microbrews, clubs, and arts together with wonderful urban parks and gardens. With no sales tax, shopping the suburban mall can also be a worthwhile experience. Outside of Portland, but in close vicinity, visitors will find the breathtaking views of the Multnomah Falls and Columbia Gorge, numerous wineries and an abundant of recreational opportunities. Note: Lists are not identical. 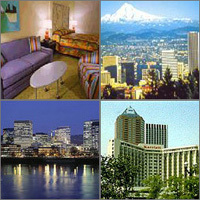 Different sites offer different accommodation options for Portland. Avalon Hotel and Spa is an elegant, intimate Portland hotel located in a natural setting on the edge of downtown with stunning views of Mt. Hood and the Willamette River. The Portland Marriott Downtown is ideally situated opposite Tom McCall Waterfront Park on Southwest Naito Parkway just one tenth mile from the Oregon Museum of Science and Industry and Portland Keller Auditorium and two miles from the Oregon Convention Center. The Benson, one of Portland's first, offers the finest amenities necessary for upholding its reputation, such as gourmet on-site dining, a jazz bar, executive exercise room, and much, much more. The Heathman Hotel is set right next to the Portland Center for the Performing Arts in downtown Portland and is connected to the Arlene Schnitzer Concert Hall. The Waterfront Park is only 6 Blocks away. The RiverPlace Hotel is a European-style hotel overlooking the marina and the RiverPlace waterfront neighborhood. Portland Marriott City Center is centrally located in the heart of Portland, within walking distance of major shopping, the Theater District, and Portland's most popular dining. The Portland Hotel Vintage Plaza is located only two blocks from Pioneer Square, Nordstrom, and Saks Fifth Avenue, in the heart of downtown Portland. Ideally located in the heart of downtown Portland, the Hotel Monaco Portland offers a standard of attentive service and exceptional value. Hotel Lucia is a new hotel located in the heart of Downtown Portland just steps from shopping, dining, and art, as well as key business destinations. Heathman Lodge is a Mountain Style Pacific Northwest lodge with the casual comforts of home. The Paramount Portland Hotel is located in the heart of downtown, one block from Pioneer Square. Centered in the heart of Portland's entertainment and cultural district, the Hilton Portland and Executive Tower is Portland's premier business hotel. The Hotel Fifty is located on the Willamette River, directly on the light rail line. This downtown Portland hotel is 2 blocks from shopping, 3 blocks from Arlene Schnitzer Concert Hall, and 3 miles from the zoo. The Red Lion Hotel at the Quay is located in downtown Vancouver WA, 10 minutes West of Portland International Airport and North of downtown Portland.